The beautiful Broad Cove Hertitage Tartan is composed of six colors woven in strands of eight. Each colour is significant to the people of the parish. The eight woven strands represent the eight districts in the Broad Cove Parish, Broad Cove Chapel, Broad Cove Marsh, Dunvegan, St. Rose, Inverside, Brook Section, Deepdale and Kenloch. White is the colour of the church and a symbol or purity. In our tartan it represents our church, St. Maragret of Scotland. This color is the basis of the tartan and all the other colours fall around it. Our church is the center of our community and the lives of our families revolve around it. Heather green represents the Scottish settlers who pioneered our parish. Our culture influences all aspects of our lives and our church lives. The natural, earth tones in this heather green are colors that represent farm life and forestry which contributed a large part to our livelihood. It also contributes to our culture. This colour symbolizes coal mining which had been a part of our parish and community for over a century. We remember the many men who mined the coal and the families that were supported by this coal mining industry. Around our tartan block is a blue border. The blue represents the beautiful ocean that borders much of our community. It makes us conscious of the joy in our hearts that God had blessed us with such beauty. Many of our former parishioners who have moved elsewhere long to enjoy again the beautiful blue waters of Broad Cove and the peace of being home. Blue symbolizes the fishing industry that is very much a part of our parish community and lives. In the very center of our tartan block is a gold cross. This indicates that the lives of our parishioners and our parish are centered on Jesus. Our strong faith and our parishes' devotion to the church is well recognized. The cross of gold symbolizes also our commitment to real Christian values, especially love of family and love of neighbours. The golden cross is our guide and our hope as we, as a family, journey through life. 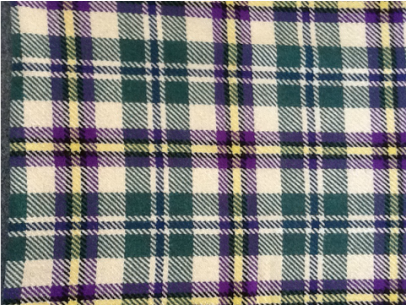 A purple cross is also seen in our tartan. The colour purple symbolizes royalty and it also symbolizes sacrifice. The colour purple is emblematic of St. Maragret, a former Queen of Scotland who is the patron saint of our parish. St. Margaret is recognized for her loving service to the poor. We wish also for the purple cross to serve as a reminder of all the generous sacrifices made by our predecessors in the faith. We honour all our sons and daughters; Bishops, Priests, religious and lay people who have served and continue to serve God, Church and society. We are always mindful and eternally grateful for their witness to Christian values which we strive to follow.